A while ago I wrote about the difficulty I was having, learning to back up our small trailer. On a recent trip, we stopped at an Amish roadside stand in western Minnesota and while my husband maneuvered our teardrop camper in the parking area of the adjacent field, I bought delicious blueberry and raspberry turnovers and some wonderful dilly beans from a very nice man whose horse stood patiently attached to a buggy, next to the booth. 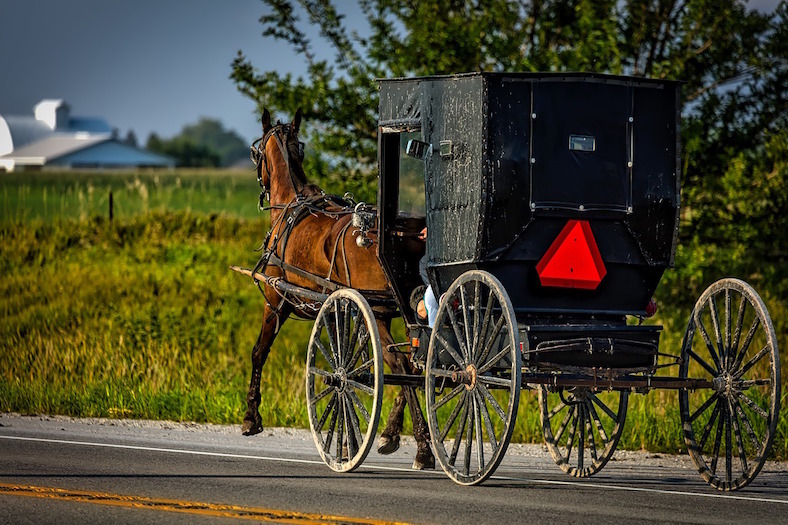 I confided in the Amish man running the stand, the difficulty I’ve had learning to turn the steering wheel of the car in the opposite direction that I hope the trailer will go. He nodded and called my attention to the fact that learning that secret of steering is the same, whether the navigating vehicle be a car or a horse. This had never occurred to me and I was fascinated enough when I got back home to watch a YouTube video, demonstrating the technique with a horse and buggy. While the man and I talked about the challenge I was having, I saw his pre-teenage son standing quietly in the background with a smile of wry amusement. I understood instantly that the young boy was already totally proficient in this.